I am so anxious for summer to arrive, it's hardly funny. This year has been a crazy one, to say the least, so the summer break promises just that - a little break with lots of warm (hot! yay!) sunshine. Summer also means the garden will be producing tomatoes and zucchini like crazy, of which I will not complain about for one single second. I made this tart a few weeks ago with summer in mind. 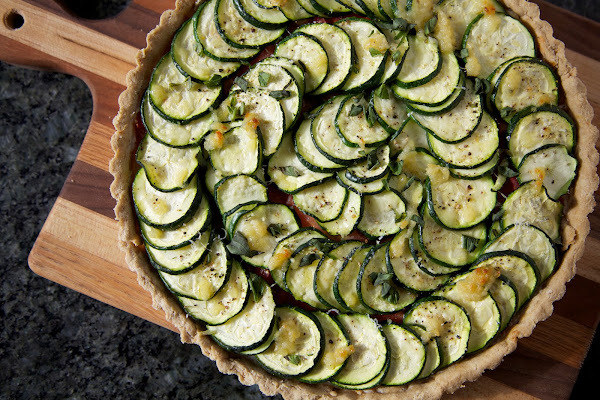 Of course, the tomatoes and zucchini came from the local grocery, but as soon as summer hits, I know this tart will taste that much better with just-picked fresh vegetables from out back. Notes: I really love this crust. I use it all the time when making savory tarts. 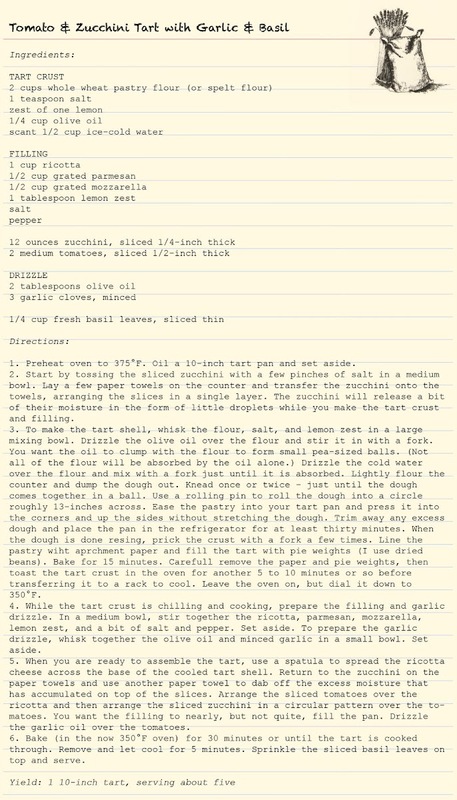 I love that it uses all whole-grain flour and olive oil. It's tender and flavorful. It's also a great one to add additional herbs to. I might try adding a little fresh basil to the dough next time. Also, this tart will feed five hungry people. I tried to stretch it to 7 one night and Dad was not happy. He wanted more. I like it when people want more... It means I did pretty good, right? This looks great Brooke! I'm excited to follow along and try your wholesome and healthy recipes! Brooke - so excited to find your blog. I also follow Heidi and her 101 recipes. I am a vegan and enjoy cooking with whole foods and alternative sweeteners since white sugar is not vegan. I do not eat meat or dairy but I love your recipes and look forward to following your blog. Take care! we make a tart like this every summer. Your blog is beautiful, and makes my mouth water, so happy to find you! Lol! Isn't zucchini wonderful!? I hope you enjoy this tart - it's a great summer dish!